Stevens Point, Wisconsin- Last night, the Ville-Marie Pirates hosted the St. George Ravens to start off the Russell Cup Finals, where they ended up winning 5-3 and taking a 1-0 series lead. However, that wasn’t the only action that was going on as the NCAA DIII National Title was being played between University Wisconsin-Stevens Pointers and Norwich University. Amongst the UWSP squad was GMHL alumni, Ethan Strong, who played two seasons in the GMHL. Strong joined the GMHL in 2010-2011 for the Bobcaygeon Bucks as a sixteen-year old rookie. This was a very strong Bucks team, with many great players, including Strong, and Nikolai Skladnichenko who went on to play in the KHL/VHL. As a rookie, Strong performed well, scoring 12 Goals 11 Assists for 23 Points in 40 Games Played. He was in the top ten for scoring on his team that season, which is an impressive feat for a rookie and a defenceman. The Bucks ended up having their best season in their franchise history that year too, finishing 6th in the league, and placing a record of 23-18-1. Unfortunately, they couldn’t match their regular season level of play, and were ousted in the first round. However, it was still a good season, and the Bucks were happy to bring Strong back for another season. Strong would go on to have a breakout year for the Bucks in 2011-2012, racking up the points, scoring 24 Goals 25 Assists for 49 Points in 29 Games Played. However, it was a season to forget for the Bucks, who ended up 13th in the standings, and missing out on the playoffs. Other teams recognized Strong’s great play though, and with the Bucks being sellers at the trade deadline, Strong was moved to the Temiscaming Titans with ten games left in the regular season. The Titans were having an incredible year, and finished 1st in the league. Going into the playoffs the Titans were favourites to win the Russell Cup. Strong played incredibly well in the Titans playoffs, scoring 3 Goals 14 Assists for 17 Points in 12 Games Played, proving to be a great deadline acquisition. The Titans would end up making it to the Russell Cup Finals, they were upset by the Sturgeon Falls Lumberjacks in six games. Strong would move on from the GMHL after this season, where he played three more seasons of junior hockey before he was committed to University Wisconsin-Stevens Pointers. Strong has been apart of University Wisconsin-Stevens Pointers for four seasons now, and is currently in his senior year with the school. In his freshman year, Strong won the NCAA DIII National Title with UWSP, which included other GMHL alumni Nick D’Avolio. In his junior year, Strong was named Assistant Captain of the team. Last night, his team played in the NCAA DIII National Title. 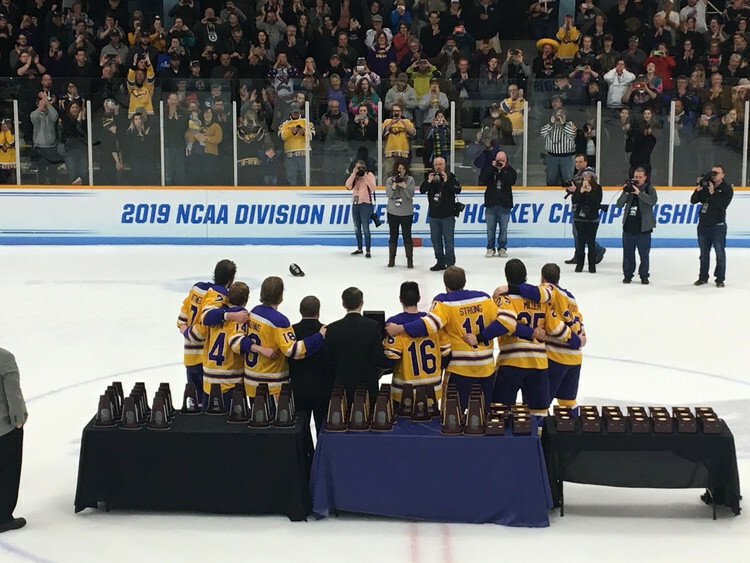 The National Title game was scoreless after two periods on Saturday, when the Pointers took a 2-0 lead in a span of 63 seconds early in the third period. But Norwich answered with their own pair over the next eight minutes. So for the second consecutive year and the seventh time in NCAA Division III history, the national title had to be determined in overtime. It was in overtime that the Pointers would take the game, winning the National Title game by a score of 3-2. They finished the year with a record of 29-0-2 and became the first NCAA DIII men’s ice hockey team to finish undefeated. 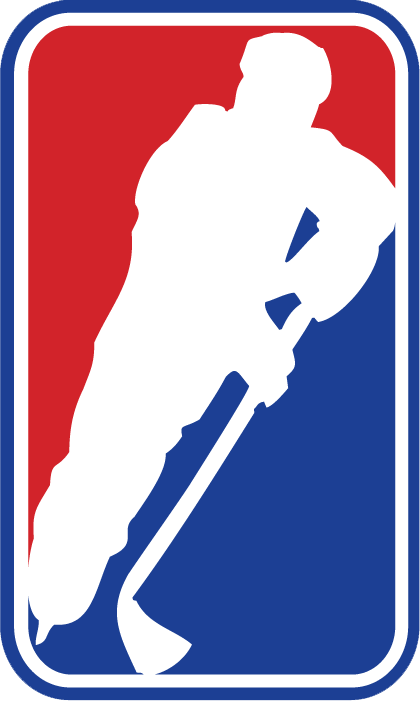 NCAA DIII hockey is the second highest level of university hockey in the United States, and has advanced players to higher levels, such as the SPHL and the ECHL. It is great to not only see one of our alumni play at this level of hockey, but also be an Assistant Captain, win the National Title twice, and make history by becoming the first men’s team to finish their year undefeated. We are proud of all of Strong’s accomplishments, and we would not only like to congratulate him on all these feats, but to wish him the best of luck in his future endeavours as well!